Vara'ha Avata'ra, or descent in the Boar. Muhammadan Sculpture in the small Golden Mosque. 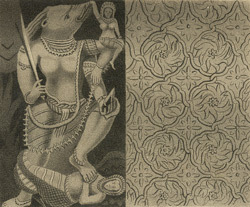 bl.uk > Online Gallery Home	> Online exhibitions	> Asia, Pacific and Africa Collections	> Vara'ha Avata'ra, or descent in the Boar. Muhammadan Sculpture in the small Golden Mosque. Aquatint by Henry Creighton dating to 1817. It shows stone slabs that were taken from the Chota Sona or Small Golden Mosque in Gaur in West Bengal. Most of the monuments in Gaur are bereft of epigraphs, some of which were removed for safekeeping while others were lost to time. The complex past of Gaur is reflected in the fact that much of the building material is the recycled remains of the sacred places of other faiths. Where an image, such as this of the boar deity Vara'ha Avata'ra, was to be totally enfolded into a different structure it was left intact. The majority of monuments that survive in Gaur date to the period following the move of the capital of the Bengal sultanate from nearby Pandua in the mid-fifteenth century.